Big sagebrush gets its name from its stature and its relation to members of the sagebrush group. Artemisia (ar-tay-MIS-ee-a) is from Artemisia, wife of Mausolus, ancient ruler of Ceria (southwest Asia Minor). She was named after Artemis, the Greek virgin goddess of the hunt and wild nature. Tridentata (tri-den-TAH-ta) means "three toothed," in reference to the three lobes on the tips of most leaves. 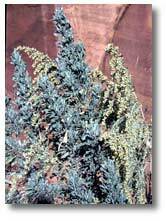 Also called big sage, common wormwood or basin sagebrush. Western. Big sagebrush occurs from California north to Canada, east to Nebraska and south to Mexico. Sagebrush prefers drier plains, mesas or rocky areas with deep soils. The plants are found from four thousand to ten thousand feet in elevation. Big sagebrush often grows in habitats such as the cold desert shrub or pinyon-juniper woodlands. This plant can also grow in vast tracts. Sagebrush ecosystems have the largest habitat range in the United States, covering nearly four hundred and seventy thousand square miles across eleven western states. A perennial shrub that grows from two to seven feet tall. A stout trunk bears many side branches that ascend upwards. The young stems are smooth and silvery, but as the plant matures, these stems turn grayer and the bark starts to grow in long strips. The evergreen leaves are one quarter inch to two inches long, wedge-shaped and with three or five lobes at the tip. Nonlobed leaves may grow in the early winter. Flowering stems grow near the ends of the branches and numerous side branches. Dense clusters of tiny yellow or cream-colored flowers are borne along a main stalk with many side stems. Seeds are tiny and black. Big sagebrush blooms in late summer. One mature plant may produce up to one million seeds. Big sagebrush is Nevada's State Plant, which is nicknamed the Sagebrush State. Big sagebrush is an important winter browse plant for a number of wildlife species, including pronghorn, mule deer, domestic livestock, sage grouse and many small mammals. More than seventy percent of the sage grouse's diet consists of sagebrush leaves and buds. The sage grouse use large clearings in the sagebrush habitat to conduct spring mating dances. These areas, known as leks, are the scenes of early morning activity in which males inflate yellow air sacs located in their chest, puff up their feathers and spread their tail feathers before strutting around the lek in the attempt to bond with one or more females. The leaves contain aromatic volatile oils to prevent herbivores from digesting their leaves. Many animals, however, will feed upon sagebrush when other food resources are scarce. The leaves have a turpentine fragrance, and after a rainstorm, they perfume the air with a sweet, pungent aroma. With leaves remaining on the plant during the winter, the plant can photosynthesize later in the year and earlier in the spring than many other plants. Sagebrush can take advantage of the long growing season, photosynthesizing even when temperatures are near freezing. 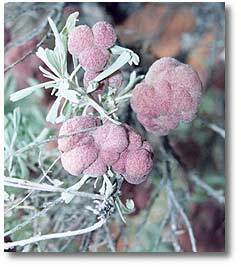 Often, purplish insect galls occur on the plant. These are caused by the chemical secretions of insects that alter the plant’s growth cells, which then form a protective covering around the insect's larvae. Big sagebrush was commonly used by many Native Americans. The wood was burned for fuel or used in construction of dwellings. The leaves and the seeds were eaten. The leaves, which contain camphor, were also used medicinally for coughs, colds, headaches, stomach aches, fevers and to relieve pain during child birthing. Poultices of wet leaves were applied to bruises to reduce swelling. Navajo weavers boiled the leaves and flowers to create a yellow-gold color, used to dye wool. Ute Indians wove the shredded bark into wicks for candles, and they made sacks of woven bark and lined them with the grass.